Lucy D'Mot is visiting all 70 of the California state parks that are on the closure list and blogging about it. Check out her blog posts at . To read more about her, see today's article in the San Francisco Chronicle. 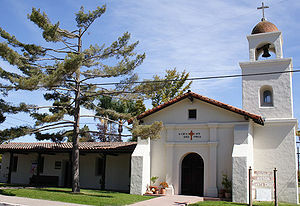 Click to read more about Mission Santa Cruz. Babushka Russian Deli and Restaurant 1475 Newell Ave./S. Main St., (925) 210-0779. L M-F, D W-Sat, SunBr; $$. Situated upromisingly in a bleak strip mall, where parking is difficult, this tiny deli fronts a larger dark, yet elegantly appointed, restaurant in the back featuring finely set cloth-covered tables and a mirrored wall. When the drapes are pulled back, the room lightens a bit and you have a view of the parking lot made pastoral by some mature trees. On the day I dined here no one else showed for lunch, though a steady flow of people came into the deli. Typical Russian specialties are on the menu. We shared plates of tasty stuffed cabbagle and pelmeni. No sides come with lunch entrees, so I advise sharing a salad and entrée and perhaps an appetizer. Next time I will save room for the sour cherry vareniki dessert. Tea Room Café 316 Western Ave., (707) 765-0199. M-F 7:30-3, Sat-Sun 8-2; $$. No reservations. No credit cards. Casual, noisy, and featuring a cheery French flair, this cafe is perfect for breakfast. Diners order at the counter—allow plenty of time, because the chalk-board menu has small print and a vast selection—then find a seat in the big open room or out by the sidewalk. Choose a goat cheese-tomato-avocado omelet, a corn waffle with real maple syrup, fluffy sour cream pancakes, sweet little eggs in a hole spiced up with harissa (ask for the eggs to be runny if you like them that way, because otherwise they might come out almost hard boiled). An array of scones and big puffy croissants are also options. The perfect latte is served in a big French-style bowl, and orange juice is fresh squeezed. Lunch brings on sandwiches, including a veggie burger. Luma 500 First St., in Riverfront Warehouse District, (707) 658-1940. D Tu-Sun, SunBr; $$. No reservations. Situated in the hinterlands of town, this inviting and popular spot has some comfy booth seating as well as overflow stools at the bar. House-marinated olives are worth ordering right off to nibble along with swallows of the house cucumber water while perusing the menu. Two can eat well sharing a beet and arugula salad and a pizza, perhaps the Satan's Kiss topped with housemade Italian sausage, leeks, and ricotta cheese. Delicious fried Brussels sprouts and Key lime pie are specialties, and the Harris Ranch Black Angus skirt steak with chimichurri sauce and South American root vegetable smash sounds worth another visit. Lagunitas TapRoom and Beer Sanctuary 1280 N. McDowell Blvd., 5 mi. N of downtown. No reservations. This way big beer garden is a surprise to find hidden in an office park. It features long communal picnic tables—some especially for families—as well as a few fire pits and lounge chairs. Indoor seating is also available, and live music entertains on weekends. Complimentary beer snacks include delicious peanuts in the shell and pretzels, but a menu offers more substantial drinking accompaniments such as pulled-pork sliders sausages, and chili. Though this brewery is justifiably famous for its IPA, it is also well-known for its seasonal ales and cleverly-named brews—how about a Hairy Eyeball or Brown Shugga?--and many of the brews are available only on-site (try a customized sampler). Intimate concerts are also regularly scheduled in the brand new grassy amphitheater. Tours of the adjacent Lagunitas Brewing Co. are available. Still relatively undiscovered in its medical center hideaway, Casa Mañana serves breakfast all day. Don't miss the cheese pupusas mojadas when available. This is said to be Marin county’s oldest family-owned restaurant. Have you ever seen the surfers at Fort Point? BeBop CLOSED 2975 College Ave./Ashby Ave., Elmwood, Claremont, (510) 848-8081. L-D daily; $. No reservations. Celebrating the traditional Korean bibimbap rice bowl, this small clean-lined cafe provides a choice of cold bowls or hot stone bowls. For the hot bowl, the cold-bowl version is placed in a heavy bowl that cooks the ingredients continuously while you eat. In fact, you need to keep stirring to get the crispy rice forming on the bottom up to the top (rice is a choice of white, brown or mixed grain). Amazingly, the stone bowl cooks the food so hot that my waiter gave me a plate to put the hot food on to cool down so I wouldn’t burn my mouth. Menu choices come from adding specific additional ingredients to the basic vegetables and rice—perhaps some marinated sliced beef or chicken or spicy shrimp or mixed mushrooms. Cuttlefish and raw salmon are also options, as is the traditional egg on top. The idea is to mix everything together to meld the flavors. Bowls come with a delicious traditional red pepper paste sauce and choice of three others, as well as hot roasted rice-green tea, an appetizer of creamy pumpkin porridge, vegetarian broth soup, and a few tiny side dishes. No MSG is used, and a natural plum sweetener is substituted for cane sugar. Utensils here are a long spoon and metal chopsticks, but a fork is available upon request.